BD – Business development – is the common terms that covers marketing and sales for a design practice. However, many firms see this activity as a “stand alone” part of what they do, not intrinsically connected to the rest of the ways they relate to their clients. This is a mistake, albeit a common one. Do we have the best marketing approach? Our work with scores of design firms, helping them to rethink and revitalise their marketing efforts, has convinced us that the traditional BD approach is missing an opportunity to create a far more powerful and effective marketing approach. 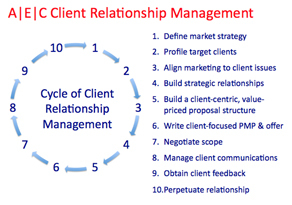 We call it CRM: Client Relationship Management. You can download our paper on the topic, and see if you agree. There is another thought track that you can use to dramatically improve your chances of keeping your clients with you on your journey: The Client Comfort Zone. Download the paper.